For service information in Polk County, click the photo above. To find out if we service your specific address, please use the online tool at the “Customer Service” link below. We provide a variety of commercial service options, each tailored to meet your specific needs. From weekly service of steel containers for restaurants and mid-sized businesses, all the way up to roll-off type drop boxes for industrial applications. Most service is billed on a monthly basis, and containers are scheduled to be dumped at least once every week on regular weekly schedules. *Your monthly rate depends on your property’s current service designation and relates generally to your distance from the Salem City Limits; Urban, Rural, or Distant. If you’re unsure about how your property is classified, contact our office for assistance. The following rates are for the Urban service designation; Rural and Distant rates are higher. **Please note that containers over 3 yds. in size are not available with wheels. Please do not overload the container. Lids must close. Extras may be placed next to the container for pick-up. Additional charges will apply. Prohibited items include: Appliances, tires, car batteries, paint, fluids, concrete, dirt, rock, TV’s, and computers. We are able to collect these items separately for nominal fees. Call our office for details. Based on cost/density issues, there is no commercial recycling in areas designated as Rural or Distant. Commercial recycling in areas designated as Urban is limited. We do, however, maintain a 24 hour recycling depot for drop off customers; located at 2525 Salem-Dallas Hwy. NW in Salem; on the highway just out of West Salem toward the beach. Contact our office for details. Mixed Paper: We can accept any print-quality paper, such as; Newspaper, magazines, junk mail, office papers, school papers, and books. Please place loose into the mixed recycling bins. We cannot accept anything contaminated with plastic, oil, paint, mud, wax, tissue, or photographs. Clean papers only. Please, NO shredded paper. Cardboard & Grey-board: We can accept corrugated shipping boxes or cereal/tissue box type material. Please open both ends, flatten, and place loose into the mixed recycling bins. No waxy or frozen food boxes. We cannot accept anything contaminated with paint, mud, grease, or food. Tin & Aluminum Cans Only: Please rinse clean and place loose into mixed recycling bins. No need to remove labels, but if you do take the time to separate the labels, they will wind up being recycled with the mixed papers. Leave lids attached to cans or place them inside cans and fold the can shut to keep them inside. No foil or scrap metal of any kind. Food-Grade Glass Bottles & Jars: PLEASE KEEP SEPARATE FROM THE MIXED RECYCLING AND PLACE INTO THE APPROPRIATE GLASS CONTAINER. It’s OK to mix colors, but please rinse clean. No need to remove labels. We cannot accept any other type of glass. No window glass, Pyrex, vases, dishes, cups, light bulbs, or florescent tubes. Used Motor Oil: Must be placed in a plastic jug with a screw-on lid. DO NOT EMPTY YOUR CONTAINERS INTO THE DEPOT’S EMERGENCY SPILL BASIN! We cannot accept oil that is contaminated with water or anti-freeze. Within the Urban designation, service packages are designed to encourage recycling by providing the largest possible container for recyclables, and charging a rate for the whole package based on the size of the garbage cart. Urban service packages include weekly service of the garbage and every other week service of the blue recycling cart and red basket. 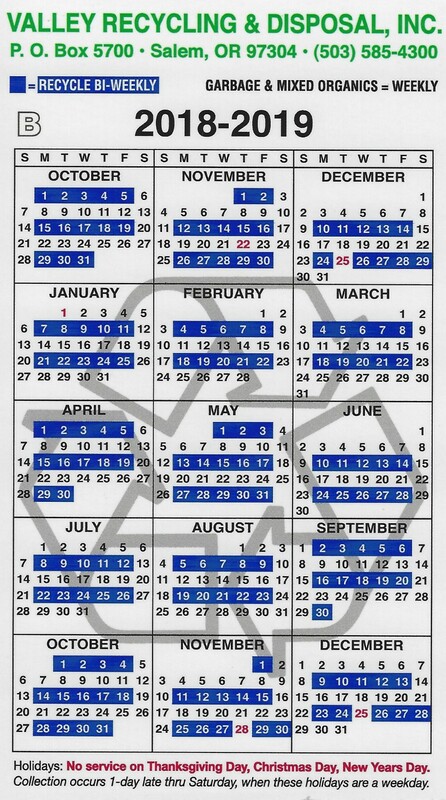 At the time of delivery you will receive a handy recycling brochure that explains what can go in the blue cart and red basket; as well as a Salem/Polk calendar that tells you which weeks to set them out. The rate for service is based on the size of the garbage cart and placement to the nearest County-maintained road. Trash Size: 20 gal. 35 gal. 65 gal. 95 gal. Urban: $ 14.50/mo. $ 15.05/mo. $ 19.95/mo. $ 24.30/mo. Rural: N/A $ 14.70/mo. $ 19.50/mo. $ 25.15/mo. Distant: N/A $ 16.10/mo. $ 20.90/mo. $ 28.35/mo. Tin & Aluminum Cans Only: Please rinse clean. Place loose into mixed recycling bins. No need to remove labels, but if you do take the time to separate the labels, they will wind up being recycled with the mixed papers. Leave lids attached to cans, or place them inside the can and fold the can shut to keep them in. No scrap metal of any kind. Food-Grade Glass Bottles & Jars: PLEASE KEEP SEPARATE FROM THE MIXED RECYCLING AND PLACE INTO THE APPROPRIATE GLASS CONTAINER. OK to mix colors. Please rinse clean. No need to remove labels. We cannot accept any other type of glass. No window glass, pyrex, vases, dishes, cups, light bulbs, or florescent tubes. We can deliver 1, 2, or 3 yd. commercial containers for special clean-up projects. All rates are based on a monthly rental with four dumps included. A one-time delivery fee of $30.00 will apply. We can also pick up piles of loose material (see “Special Removal and Clean-Up Services” tab above for more info), if you don’t have enough material to make getting a container for a month cost effective. Call us for a free estimate on the most economical disposal options. Please do not overload the container. Lids must close. Extras may be placed next to container for pick-up. Additional charges will apply. Prohibited items include: Appliances, tires, car batteries, paint, fluids, concrete, dirt, rock, TV’s, and computers. We are able to collect these items separately for nominal fees. Additional charges may apply. Call our office for details, at (503) 585-4300. 95 gallon The size of the blue recycling carts that you see within the UGB. For service, just call our office at (503) 585-4300. Within the Urban service area, residential service packages include a 95 gallon blue cart for mixed recycling, a small, red basket for items that require special handling (glass bottles and jars, used dry-cell batteries, usable paint, and used motor oil, cooking oil, and anti-freeze); and a grey cart for garbage. The rate for the whole package is based on the size of the garbage cart. Garbage collection is weekly and recycling collection is every other week. The red basket is always collected on the same day as the blue cart. At the time of delivery, we provide you with a convenient, color-coded calendar that tells you which weeks to set out the recycling. Even if you’re not a regular, weekly garbage customer, you may be able to take advantage of curbside recycling for a small monthly fee. 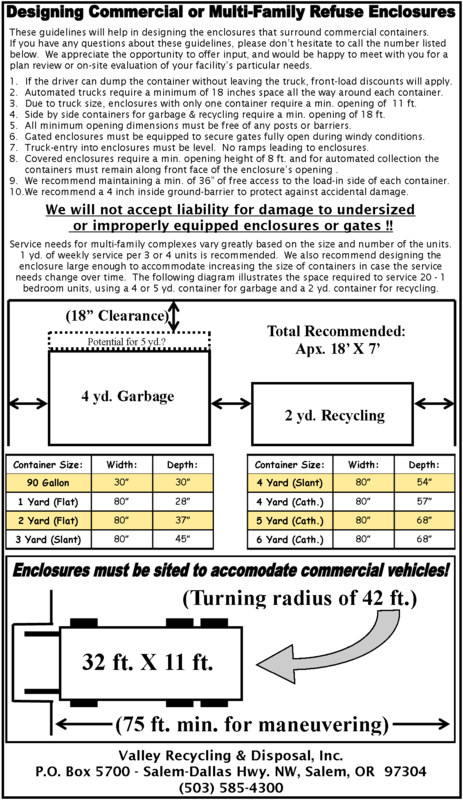 We also provide you with a convenient recycling guide to let you know what can go into each container.